Problem: Holt-Cat’s Machine Division is in charge of maintaining tens of thousands of tools ranging in price from a few dollars up to $18,000. With 16 separate facilities in the state of Texas, the movement of these tools without proper tracking was resulting in loss of money and employee productivity. Solution: Omni-ID UHF RFID tags on every tool and HF RFID tags on each employee badge enabled Holt-Cat’s software to read and associate the employee with the tool removed from the tool room. By using a portal-type RFID system at each entrance/exit of a tool room, Holt-Cat was able to monitor the employees and tools without adding additional processes that could have slowed down productivity. Notable Take-away: By using an RFID tool tracking system, Holt-Cat was able to see a return on investment in less than eight months. Problem: Wasted time and money spent staffing an equipment/tool room with employees in order to maintain inventory and prevent lost or stolen tools. Solution: Pressure sensitive mats alert the RFID reader to scan the employee’s badge, which allows the employee access to the tool room. All the tools are tagged, and when the employee is leaving the room, the doorway reader and antenna system scan the employee’s badge as well as the tool’s RFID tag. Notable Take-away: With an initial $250,000 return on investment, and growing, Motorola has seen boosted productivity, less employee hours in equipment rooms, and no equipment losses. Problem: On a daily basis, Grunnarbeid has thousands of tools waiting to be delivered to different construction sites. 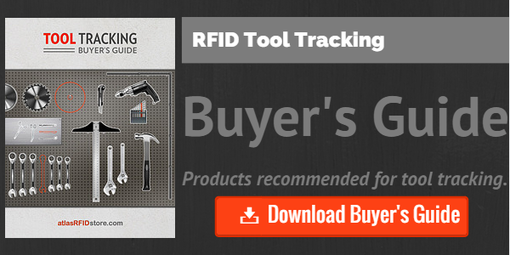 Tools are often lost during transportation, and many man hours are wasted searching for them. As a result of the delivery delay, other employees are forced to waste time waiting for the lost tools. Solution: All high-value tools are tagged with Omni-ID tags, and when read, the tag’s information as well as longitude and latitude (from the reader) are uploaded to the software component. Dock doors are fitted with portal systems, delivery vehicles have fixed reader systems, and the warehouse staff is provided with handheld readers. Notable Take-away: From information gathered from the pilot program, it is estimated that Grunnarbeid will reduce daily deliveries (consisting of employee hours and company money) by 80 percent. Problem: Ford, DeWALT, and ThingMagic came together to create a product to address a common problem in the construction industry. Mobile inventory can take hours in the construction industry, and loss of high value tools are a common problem. Solution: These three companies created a mobile solution called ‘Tool Link’ which will read the RFID tagged tools in the bed of a pickup truck, which has built-in RFID readers and antennas to take inventory. Notable Take-away: Tool Link is able to take mobile inventory before and after a jobsite so that unpreparedness and lost tools are a thing of the past. This system will help to revolutionize any industry that relies on tools on a day to day basis.